Celebrating 70 Years of Learning with ‘66 Alumna Margery Kraus The School of Professional & Extended Studies sits down with Founder & Executive Chairman of APCO Worldwide Margery Kraus to honor the Washington Semester Program’s legacy of excellence. When Margery Kraus was a student in the Washington Semester Program in 1966, she found herself in the middle of a judicial committee hearing in the House of Representatives one day, listening intently to a conversation among lawmakers who were discussing the National Football League and American Football League merger. New York Congressman Emanuel Celler had the floor to discuss his views of the merger, and Kraus recalls watching as a younger, less experienced congressman struggled to get a question in. As a college-aged student studying political science at American University, Kraus saw first-hand the clear chain-of-command that was present in the decision-making process of government. Instead of reading a book in class about the US policymaking process, Kraus was face-to-face with the very people who made these bills into laws. Today, she joins the School of Professional & Extended Studies in celebrating 70 years of experiential learning through this hallmark program -- a program that champions the unique experiences of over 40,000 alumni across more than 125 partnering academic institutions around the world. "[The Washington Semester Program] made me realize the importance of exposure: learning by doing and learning by seeing is different from learning by reading and studying. The experiential component of this program is certainly one of its strengths. Government is not a spectator sport." 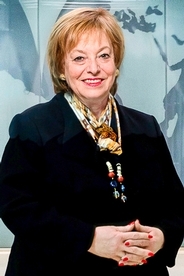 Margery Kraus is not only a part of the AU community as an American University Trustee and alumni of the School of Public Affairs, but she is also a known trailblazer in the world of public relations, public administration, and business diplomacy. She credits her experience with the Washington Semester Program (WSP) as one that gave her the necessary foothold to thrive in the nation's capitol and in her highly-decorated career. As a founder and chief executive officer of an international global consulting firm known as APCO Worldwide, Margery Kraus has been a true trailblazer -- oftentimes thriving in spaces where she has stood alone or among few other women in her profession. "The Washington Semester Program was profound [in leading] me to be one of the people to put together the Close Up Foundation. It has a lot of the elements of Washington Semester [in that it] offers people the experience of being in Washington, of learning first-hand how things work, of understanding the profound impact that personal experience can have on people." "My favorite quote from Eleanor Roosevelt is 'nobody could make you feel inferior without your own consent.' So, it's important to have a thick skin and a vision for what you are trying to do. You also have to be realistic: don't glamorize what it's going to take [to reach your goals]." "The future generation of leaders need to have the capacity to look at our complex environment, process what they see, and simplify it into actions that make a difference for themselves or their organization," says Kraus. "With all the news and communications sources that exist, there's a lot of misinformation as well as good information floating around. Getting a chance to be able to see it for yourself and make your own assessment makes you a better student of the political process and of how government works. [These skills] have become more important than they have been before." Moreover, this notable Washington Semester Program alumna encourages students and young professionals to be independent learners who can engage with diverse stakeholders across platforms that perform widely different functions. One of the best ways to do this is through the real-world, qualitative experience provided by WSP. "This program is an important part of AU's brand," Kraus affirms. "The opportunities it offers students from other institutions as well as [those at] AU is an important component to the university [as a whole], and the idea of having a very practical hands-on experience is key to having a well-rounded education. I really benefited a lot from it, and I hope it will continue to benefit others for a long time." The Washington Semester Program is founded on the values of experiential learning -- of going out into the "real world" and acquiring hands-on experience that is immediately applicable to the formative years of a student's career trajectory. Margery Kraus stands proudly among a community of alumni who continue to make positive contributions to our global community: from members of congress, to recipients of Golden Globes, to renowned broadcast journalists and experts in the fields of foreign policy, higher education, environmental sustainability, and more. With 70 years of academic and career development success under its belt, the School of Professional & Extended Studies looks expectantly toward the future to another 70 years -- and then some -- of academic and professional achievement.